The Good Manufacturing Practice (GMP) is a regulation which certifies that cleanliness of the staff’s hygiene, use of equipment, production of our tea, as well as the environment of the premise where our tea are produced and packed, attest to the quality of relevant standards. The Hazard Analysis Critical Control Point also known as the HACCP is a management system which addresses safety of the tea. It uses preventive methods to ensure that the tea do not become unsafe in terms of biological, chemical and physical hazard. The ISO 22000 is a food management system that must be applied in all organization related to food chain. The ISO certifies that the ingredients acquired from suppliers are safe and devoid of danger. Certification from ISO is the best guarantee that the things consumed from our company are safe for consumption. Our production facility is fully JAKIM Halal certified, MS1500:2009 1066-11/2014, the highest Halal Certification quality worldwide. This certification will allow our Muslim friends to consume our products with full confidence. 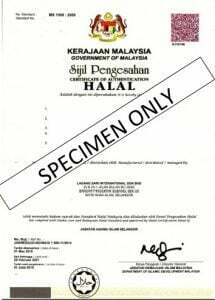 Halal certification means that our production facility is free from products and by-products of swine/pork, animals not properly slaughtered, alcoholic drinks and intoxicants, carnivorous animals, and birds of prey (raptors), blood and its by products, foods containing gelatin, enzymes, emulsifiers and flavours.